If the Farnsworth House, aka “The House of Worship,” had stained glass. Another YouTube video. Of course, one of the miracles of the Farnsworth is how it heightens the colors of nature outside of its lens. 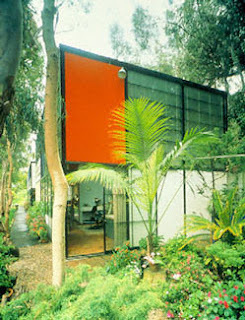 And didn’t Charles and Ray Eames do a kind of colored Mies-style house in L.A.?